WE DO NOT SELL RE-ISSUES — ONLY ORIGINAL PRESSINGS. Shall be recieved within 5 days. M (mint) Record is new, shiny, never played; cover is new, sometimes record is still sealed. NM (near mint) Record is like new, probably played a few times, but that doesn’t effect on the quality of a sound; cover has none lack, it is almost new. EX (excellent) Record in great shape, may have light marks, played more than a few times but low in surface noise or no surface noise; cover may be little bend on corners and edges and have a little fade in colors. VG+ (very good plus) Record has been played more times, it has marks and some light surface noise, it doesn’t skip; cover has some fade in color, and has more damage on the corners or edges. VG (very good) Record has been played many times, more surface noise, but it shouldn’t skip while playing; cover has more cuts on corners and edges and more fading in colors. G (good) Record or cover are in poor condition, this is worth only for archive items – just to have that until you find better one. The + or – signs are used to further describe the condition if necessary. Get Images that Make Supersized Seem Small. Track Page Views With. Auctiva’s FREE Counter. 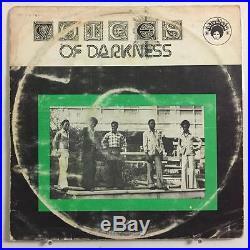 The item “VOICES OF DARKNESS S/T AFRODISIA AFRO FUNK BEAT PSYCH LP VG SUPER RARE OG” is in sale since Saturday, July 08, 2017. This item is in the category “Music\Records”. The seller is “hififorfood” and is located in New York, New York. This item can be shipped worldwide.